Honor, the e-brand of Huawei has just launched the mid range Honor 8 Pro smartphone in India. Honor 8 Pro will be exclusively available to Amazon Prime members on Prime Day starting 6 PM on July 10th on Amazon.in. The phone is priced at Rs. 29,999 for the 6 GB RAM +128 GB storage variant and will be available in color options of Midnight Black & Navy Blue. Honor 8 Pro was launched in Europe in March 2017 with the price of 474.99 GBP in the UK and 549 Euros in Europe. 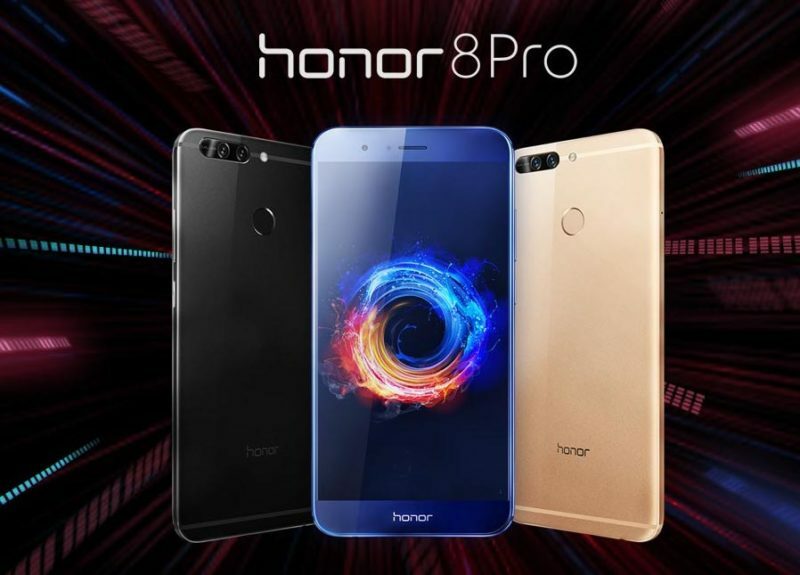 Honor 8 Pro sports a 5.7-inch Quad HD 2.5D curved glass display, powered by Huawei’s own Octa-Core Kirin 960 processor along with 6 GB of RAM and 64 GB of internal storage along with support for expandable storage via microSD cards. It runs on Android 7.0 (Nougat) based operating system with Emotion UI 5.1 on top of it. In terms of camera, it features a dual camera setup with camera sensors of 12 MP (Monochrome) + 12MP (RGB) with dual-tone LED flash, f/2.2 aperture, 4k video recording and another 8 MP front-shooter with f/2.0 aperture. Honor 8 Pro includes Hybrid Dual SIM, Fingerprint sensor at the rear panel and Infrared sensor. The phone is backed by a battery of 4,000 mAh which supports fast charging. It weighs 185 grammes thanks to its massive battery and big display.